An air quality test at the school revealing airborne asbestos is at least the third such incident the Orleans Parish school district has faced this year. This time, clean-up is going to cost the district $1.3 million. 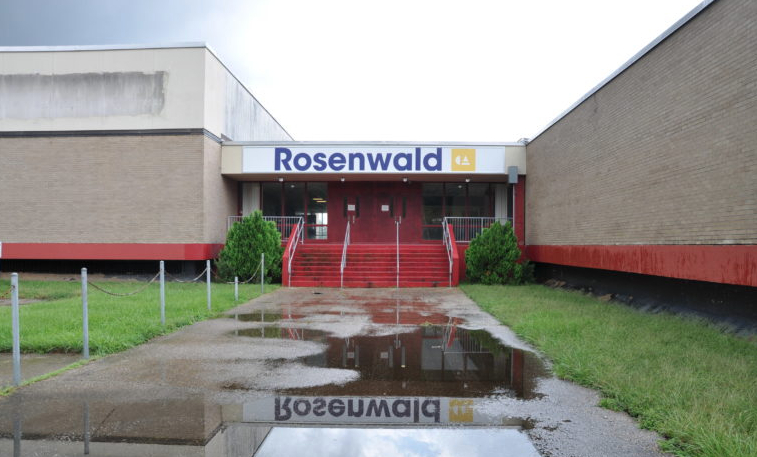 The problem at Rosenwald wasn’t detected by either the state-run Recovery School District, which formerly controlled the building, or the Orleans Parish school district, which took it over this spring. The school was previously used by the Algiers Charter School Association. It closed in June 2017 to allow students to attend better schools. After the 46-year-old building went back to local control, Collegiate Academies, a charter school network, was planning to open a new school in the Rosenwald building this fall, hence the new sign. Collegiate found the worrisome asbestos levels, apparently in preparation to remove buckling floor tile. The results of the City Council investigation into the Entergy paid actor scheme is being delayed for a second time. On Thursday, the City Council voted unanimously to extend the deadline for the investigators’ report until Nov. 2, nearly two months later than the original due date. For both extensions, investigators requested more time to process newly delivered documents from Entergy, which reportedly continued to trickle in this week. Prior to the council vote, the deadline was set for Friday. “We wanted to ensure the investigators finalize their work and had the opportunity to review all documents — including some requests apparently fulfilled in the past several days,” Andrew Tuozzolo, Councilwoman Helena Moreno’s chief of staff, said in an email. The City Council announced that it was launching an investigation three weeks after The Lens reported that people, including some professional actors, were paid to show up to City Council meetings and deliver speeches in favor of Entergy’s proposed $210 million power plant in eastern New Orleans. The company that created the Sewerage and Water Board’s new billing system, the Cogsdale Corporation, apparently wasn’t informed about rampant billing problems until they read about it in the newspaper, a Cogsdale official told the New Orleans City Council’s Public Works Committee on Monday. “We’ve never had a straight crisis contact with S&B at any time,” said Judy Wells, Cogsdale’s director of professional services. But later in the week, the Sewerage and Water Board and Cogsdale issued a joint statement, according to the New Orleans Advocate. It did not explain the discrepancy between those accounts. The new billing system was launched in October 2016. Since then, thousands of New Orleans customers have reported errant bills, including some high-profile cases in which customers were charged thousands, or even tens of thousands, in a single month. Producer Tom Wright interviews reporter Michael Stein about his interviews with economists who question UNO’s short-term rental study. Wright also speaks with reporter Marta Jewson about her search into what caused an asbestos release at Rosenwald school, closing the building for foreseeable future. The Innocence Project New Orleans’ Executive Director Jee Park also joins Wright to talk about Constitutional Amendment 2, which would require unanimous jury decisions instead of the currently allowed split juries. It will be on the ballot Nov. 6. This year, for the second time, The Lens is partnering with ProPublica’s Electionland, a nationwide coalition of newsrooms that are covering voting problems. We have set up several ways to get in touch with us on election day or during early voting, which starts Oct. 23. In 2016, Electionland newsrooms went through thousand of tips from a legal call center hotline, as well as thousands of text messages and social media posts.